I never got to meet you Uncle Werner, you were taken from us before I was even born, but I know you got my back. I think of you often as I get ready for work. Mark's Mother is obviously an idiotic white; who else could know so little about the subject at hand while making such bold claims regarding it? Wow!! It fills my heart with deep despair to know that funds from Colin Kaepernick have been sent to and used to support a group called "Assata’s Daughters." This is a Chicago based group that focuses on black female empowerment in the tradition of Asaata Shakur. As most of you know, Assata Shakur, is Joanne Chessimard, the lady who participated in the homicide of Trooper Foerster in 1973. Nike sure slapped many people in their face when they supported this unpatriotic, unfaithful, arrogant individual. 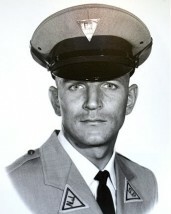 May Trooper Foerster continue to rest in eternal peace!!! It will soon be forty-five years. I was one of the EMS crew that picked your lifeless body up. The impact remains with me today. Your and your family’s sacrifice will never be forgotten. Thank you for your service. This article doesn't even come close to the violence and animalistic nature of Joanne. I dealt with her EVERY DAY when we held her for and during her trial. The evidence was OVERWELMINGLY brutal in nature. After he was shot, she went over and kicked him in the head so many times that the blood caked on her stockings to where they literally stood up by themselves in the courtroom. Her escape from the Clinton Prison was nothing more than a military type of assault on the complex with automatic weapons. Her lawyers got her moved to that minimum security facility despite the states disagreement, and that move was only supposed to be temporary. The Obama administration SHOULD have demanded her return BEFORE normalization of dealing with CUBA, but then, that wasn't part of the agenda. It is astonishing that sanctuary is granted to the female suspect in Cuba. It is also astonishing if you read some of the things said by the suspects' revisionist supporters that explicitly ignore the truth. I feel like the suspects section should be listed 1 sentenced to life, 1 at large, as the gunman who actually struggled with and killed Foerster is imprisoned for life, while the female accomplice is the one freely living in Cuba, untouched by the law. May you continue to rest in peace Trooper Foerster. Some good news today. Cuba has agreed to discuss U.S. fugitives living in Cuba including Chesimard who I pray is extradited to the U.S. so she may spend the rest of her undeserved days of life in a N.J. State prison. Continue to Rest in Peace my brother, and we will continue to keep the watch. My thoughts and prayers are with your family and friends. We will seek out the "one that got away" in Cuba in the coming months and bring her to justice. Dear Trooper Werner Foerster, I shall never forget the "Great Impact" of Love, Friendship, Admiration, Duty, Honor, and Fidelity, YOU left on my life! I've dedicated the strategy of "ICH SPECHEN!" = "I SPEAK" in German; to YOU and YOUR FAMILY in all of my very extensive investigations. "OPERATION EYES OF GOD" Launched Jan. 1983 and ongoing. And others from an even earlier time. I know that you are in Heaven because we spoke of that "Great Faith" that You had in JESUS, the Love You had for America, and Your Wife and Children! Goot Juden-Christer-Americaner und Trooper Mit GOT! = Good Judeo-Christian-American and Trooper With GOD! WERNER FOERSTER. Your friend, Brian C. P. Parkinson "The Specialist" May 2nd, 2014/1973 GOD BLESS YOUR TROOPER SON and FAMILY!!!!!!! I have always believed that the NJ State Police were the best in the country. They face dangers that have caused the loss of these wonderful men and women. RIP Werner Foerster, the people of NJ will always remember you and pray for the arrest of the pig that did this. Today is the 40th anniversity of your heinous murder at the hands of Joanne Chesimard. While she still goes free New Jersey has just doubled the reward for her captiure to $2M. Let us hope that this brings this soulless criminal back to be incarcerated. You had the guts to walk up to suspects and stand up to them in a gunfight, one of the classic shootouts of northeastern US history. That was impressive. May you continue to rest in peace Trooper Foerster and to think that Chesimard is still on the loose bothers me to no end. Then to think that a Rapper who sings favorably of her was invited to the White House...ah never mind. I passed over the Werner Foerster Memorial Bridge today. The memory of what happened there still burns in my mind. You have not been forgotten. I can still remember the day that Tpr Foerster was killed. I was in high school in Sayreville,NJ but wanting to be a NJ State Trooper it had profound and forever memories of this tragic and brutal killing . Your heroism and service is honored today on the 39th anniversary of your death. Your memory lives and you continue to inspire. Thank you for your service. You died on my 8th Birthday, and I remember it being in the news. Justice for your death has been long denied, but someday... We're waiting for her. May you rest in peace TROOPER. I was in the 5th grade when I was told of your senseless murder. My father, John Genz, knew you and thought very highly of you. I remember he said you had a German accent. I know Trooper Harper was also shot with you, but survived his wound, thank God. My class made a book for him of sympathy/et well notes I remember thinking about your children and your wife and was so very sad. As a mother now, I think of the pain of your parents then, too. I will never forget you. Thank you for your service as a NJ State Trooper. As hard as it must've been and still be, please take comfort in knowing your beloved, Trooper Werner Foerster is with God. St. Peter said so. I pray a different fate in hellfire awaits your killer if she's not already there. If living, I pray some Navy Seal spots her in the site of his rifle.